﻿ Living overseas - tricks and tests of relocating. 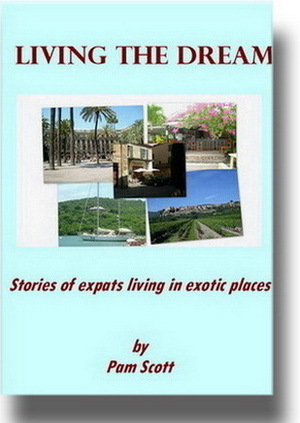 Stories of expatriates living in exotic places. Pam Scott has lived much of her life in South East Asia. And her travel tales are fascinating. Perhaps your dream is a tropical island in the Caribbean, or a teeming city in the mysterious East? Or your own year in Provence? Maybe you've even gone on to imagine actually walking out of your old mundane existence to exchange it for a life in some exotic location. Usually though, the dream fades and is stored away as something you might do 'one day'. Living the Dream is about ten adventurous souls who threw caution to the wind and headed into unknown territory. Irma moved from Finland to settle in Bangkok. Chris went from the USA to live in Chiang Mai, and Suzanne left New Zealand for Provence. Angelo sailed from Italy to Antigua in the Caribbean. Valerie, a French Algerian found her new home in Ho Chi Minh City. Roxanne left the UK for Barcelona. Chris left Australia for Lai Chau in north-west Vietnam. Susan and Mark headed across the Channel to France, and Maureen lived her dream on the waters of the Caribbean. Each decided to create a new life for themselves in another country very different from their own, not because they had to, but because they wanted to. Read how they got on. (183pp.) PDF only. Pam Scott has been a pharmacist, university lecturer and researcher, international consultant, science and technology policy analyst, businesswoman and bookshop owner. She lived and worked in Vietnam for more than a decade and travelled widely in SE Asia. In 2009, she was awarded an Asialink Literature Residency in Vietnam. She has travelled extensively in Vietnam, Myanmar and other South East Asian countries. Her eBooks, exclusive to Buzzword Books, are listed here. Pam has four more books on this site about her South East Asian travels. These are..